Cargolux Airlines and lux-Airport have launched the active phase of the airlines new headquarters building at Luxembourg. 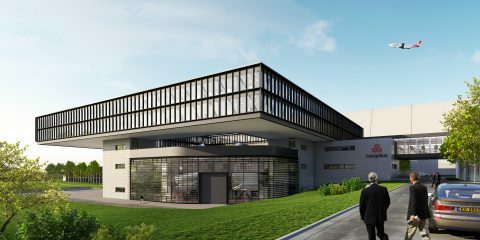 The building on the municipal territory of Sandweiler will be located adjacent to Cargolux’s maintenance hangar, to which it is connected by a glass bridge, and offers room for the company’s administrative staff with parking spaces. 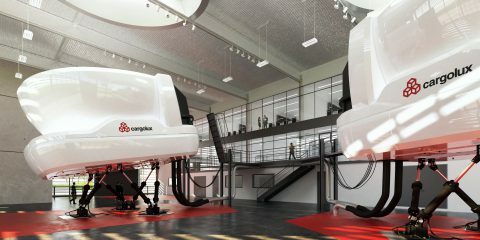 The airline’s training organization, including crew training and its two Boeing 747 simulators, will also be located there. The Cargolux administrative staff is currently spread over several locations. With the new building, the company brings everyone under one roof and facilitates closer and faster interaction between all departments. Cargolux employs close to 1,400 staff in Luxembourg, including crews and maintenance staff. Several eye-catching architectural elements highlight the design of the building; these include the glass wall of the training facilities that make the simulators visible to the public, as well as the floating top floors which house the conference and meeting center and cafeteria. The new building will be constructed and owned by lux-Airport, the management company of Luxembourg Airport. Cargolux has committed to a long-term lease contract. The first earth works are set to begin at the end of 2017 while Cargolux expects to move into the building in early 2020. Johan Vanneste, CEO of lux-Airport ads: “We’re looking forward to build for Cargolux a new state-of-the-art home at Luxembourg Airport, a centralized and efficient location as base for future growth of our home based cargo carrier.